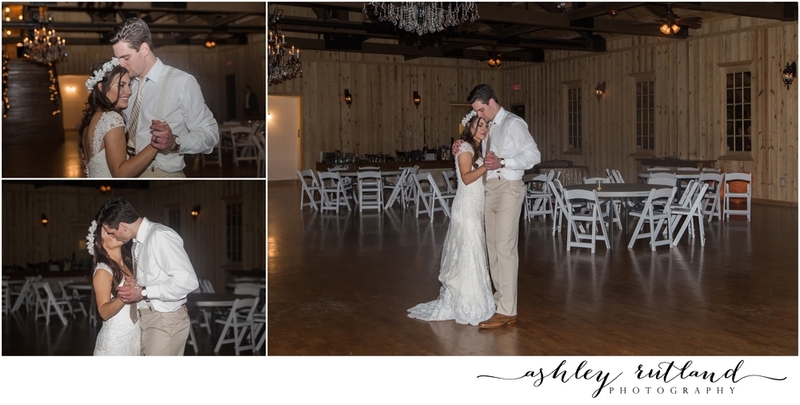 Daniel & Laynee were married on December 30th, 2015 at Hidden Springs Events in Aubrey, Texas. The day was full of love, laughter, bee attacks (see later!) and dancing! The day started out with Laynee & Daniel getting ready with their closest friends. As Laynee tightened up her dress and Daniel was adjusting his tie, we were there to capture every moment! After Daniel perfected his 'do and Laynee put on her Ugg bridal slippers, it was time for the first look! Every single detail was so well thought out and looked like something straight off a Pinterest board! And finally, it was time to get this show started! And as soon as Laynee started down the aisle, everyone stood and was just in awe of how beautiful she looked! Before the ceremony even started, the officiant, who happened to be Laynee's uncle as well, asked for the parents to come up and pray over Daniel & Laynee's marriage. I loved this moment! No words were heard by any one else except the bride & groom, their parents & God! And then, the funniest moment of the ceremony happened! A bee landed right on Laynee's dress, as they were saying their vows. You could see in Daniel's eyes that he was unsure of what to do. But as a good husband would, he smacked the bee right off her dress, in the middle of their vows! Everyone burst out in laughter and the officiant said something along the lines of "That's the best thing you've done as a husband so far!" After the minor bee incident, the ceremony went on flawlessly! And then, just like that...they were husband and wife! The crazy girls & guys!! The reception started out with a beautiful message from Daniel's parents, (the original - ha!) Mr. & Mrs. Milliman! And, then the lovely couple had their first dance, surrounded by everyone that loves them! After they cut their beautiful cake, Daniel tossed the garter and Laynee chunked her bouquet! Now, it's time to boogie! Last dance of the night! All their guests waited outside, while they had a moment to themselves to soak in the whole day. And last but not least, the bubble exit! All their friends, family & loved ones wished them well on their new adventure of husband & wife! Congratulations Daniel & Laynee! It was truly an honor to be a part of your day! I wish y'all luck, love & happiness for many years to come!! CHEERS!